Rudolf II is often remembered as a great patron of art, as someone who was passionate about collecting and who managed to create the largest art collection in all Europe, called “Kunstkammer”. Hans von Aachen of Köln married the daughter of Orlando di Lasso, a famous composer of that time, whose works are still performed. Von Aachen worked for years in Italy, then was a court painter for the Bavarian Duke Wilhelm V, and from 1507 he lived in Prague. Rudolf bestowed favour on him and 1604 he knighted him. Hans von Aachen obtained for the imperial collection the famous antique torso called Ilione, by Praxiteles. This torso became a memento of Rudolfian collections of its kind. It remained at Prague Castle until 1782 when it was auctioned off for 30 Kreuzers by enlightnement administration of the Emperor Joseph II. Today it can be seen in the Glyptothek collection in Munich. The Swiss Joseph Heintz appointed court painter of Rudolf II in 1591. He mainly devoted himself to drawing, and probably under the influence of Hans von Aachen, also became interested in painting. In the Emperor’s service he often stayed in Italy. In Graz and Innsbruck he portrayed for the Emperor ladies from high society who were considered as potential candidates for his wife. 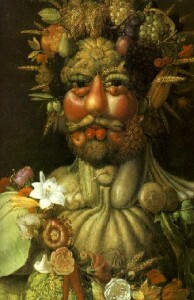 One of the famous painter of Rudolf II was the Italian Giuseppe Arcimboldo. His renown is mainly due to his originally conceived painting, wittilx composed of vegitables, fruit, flowers, etc. He thus created allegories – of the seasons, elements, and others. The Netherlandish painter Bartolomäus Spranger came from Antwerp. He worked as a court painter of Rudolf II from 1581. 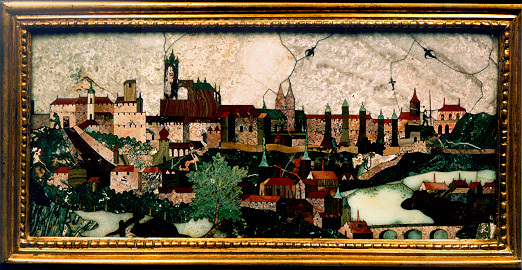 He settled in Prague, becoming member of tje Mala Strana (Lesser Town) painters’ guild in 1584. A year later he married the daughter of the goldsmith Mikulas Müller. Few people know, however, that Arcimboldo was already active aat the court of Rudolf’s father Maximilian and that he was also a designer of costumes for court ceremonies, a musician and draughtsman who documented important political evenets. Even this painter was knighted in 1580. In 1592 Emperor Rudolf II allowed him to return to Italy, where Arcimboldo died a year later. (in Prague from 1604), prints by Egidius Sadeler (court painter from 1597), whouse numerous copper engravings are notoriously known, even if not many of us are aware of their artist; the works by the miniature painter Joris Hoefnagel from Antwerp, from 1590 also a court painter, who was mainly interested in representing plants and animals, in which he achieved exceptional virtuosity; the works of Pieter Stevens, whouse numerous views of Prague now document the city’ appearance during the rule of Rudolf II. 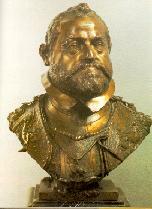 Rudolf’s sculptors included the pupil of the renowned Italian Giovanni Bologna, Adrian de Vries, who worked in Prague particularly in the years 1601 -1612. After Rudolf’ death in 1626 he worked for Albrecht of Wallenstein. The most famous works of Adrian de Vries include the portrait busts of the Emperor, his equestrian statue and the sculptures he created for the garden of Wallenstein Palace, which are now in Sweden. His works are now parts of exhibitions in London, Gotha, Drottningholm and Paris. The most remarkable works of the “Kunstkammer” undoubtedly included items of goldsmithing and stonecutting crafts. Rudolf managed to employ in his service outstanding craftsmen from Italy. the Netherlands and Germany. One of the foremost was the gem cutter Ottavio Miseroni, who came from Milan and worked for the Emperor from 1588. (Czech painter Karel Skreta portrayed his son Dionysio in a painting which is now at the national Gallery in Prague). He produced dozens of goblets and bowls of precious stones and quartz, linked by gold, whose most distinct feature is the relief figural and ornamental cutting. He is the auther of many cameo cuts, he discovered the techniques of a relief mosaic work. The goldsmith and sculptor Paulus van Vianen from Utrecht started in the imperial service in 1603. Before, he worked as a court artist of the Bavarian Elector and he also spent a year in the servide of the archbishop of Salzburg. His works include vessels decorated with rich figural scenes. With the other goldsmith Jan Vermeyen is the author of beaten metal and jewellery on the gold crown of Rudolf II, now in the Weltliche Schatzkammer, Vienna. Gem and glass cutter Caspar Lehman worked for rhe Emperor from 1588. In 1595 he was knighted by Rudolf II and in 1609 he was granted privilege for this type of glass decoration, which mainly be loaned from the Museum of Art History in Vienna, where the “Kunstkammer” forms part of the collection. Naturally, the collections of the Emperor Rudolf II cannot be reconstructed at present, but at least they can be evoked, if the exhibition is sufficiently broad-ranged. That is precisely the goal of the exhibition that is about to be opened. Prague’s musical life in the reign of Rudolf II – between 1576 and 1612 – was very rich and varied. The Habsburg court orchestra, a body that had been perfecting its skills for several decades, was transferred from Vienna to Prague. Composers attached to the Rudolfian orchestra in Prague contributed to the progress of music on a global scale. Prague attracted prominent musicians from all over Europe, whose presence there produced merging of different styles. Along with composers whose achievements won them permanent fame this text presents authors whose names have almost been forgotten, but whose music is of extremely high standard. Philippe de Monte (b. Mecheln 1521, d. Prague 1603) was a key personality in l6th century music. The leader of the Prague imperial orchestra, he was much admired and revered in his time. De Monte made Prague his real home, end he asked in his testament to be buried in Prague’s St. James’ Church. His numerous works reflect high creative spirit in all genres and forms(madrigals in the then modern “Musica reservata” style, and motets of 1575 reminiscent of Palestrina). Jacob Regnart (b. Flanders ?, d. 1599) rose in Prague to the postof deputy bandmaster. Still in Rudolf II’s time, he moved to Innsbruck but he returned to Prague in 1598. Regnart published in Prague masses dedicated to the head of the Chapter of Prague’s St. Vitus’ Cathedral, the humanist poet Jiri S. Pontan of Braitenberk. The madrigal written on a poem by Torquato Tasso, was published by the Munich music printer Adamus Berg. Alessandro Orologio (b. Italy 1550, d. Vienna 1633) was trumpeter in the Prague orchestra from 1580. He left Prague in about 1594/95. His canzonets, published in Venice, were dedicated in 1593 to the Czech nobleman Miskovsky of Mirov. To Emperor Rudolf II, Orologio dedicated the five-voice madrigals which he finished writing in Prague in May 1588 and which he published in Venice in the same year. In a year’s time, he received 60 gold pieces from the Emperor for them. Camillo Zanotti (Janotus) (b. Cesena 1545, d. Prague 1591) is one of the less well known l6th century composers. He worked as a singer. He lived in Prague from 1588, and he drew pay there as”magister secundarius”. To Rudolf II, Zanotti dedicated a madrigal on a text by Torquato Tasso, dated 30 April 1587. He was celebrated by Czech humanist poet Salamoun Franzellus of Fridental. His “Tirsi mirir volea” madrigal is based on the text by Batista Guarini of Italy. Lambertus de Sayve (b. Liege 1549, d. Linz 1619) came of a Netherlands artistic family. In his time, he was admired as composer; for instance, the theoretician and composer Michael Praetorius valued him highly. He wrote madrigals during his stay in Prague. Carl Luython (b. Antwerp 1557, d. Prague 1620] was an excellent composer, though he failed to be properly appreciated in his time. He joined the Rudolfian orchestra around 1577, and from January 1582 be was its organist. A quiet introvert (as witnessed by the organmaker Jachym Rudner, who built the organ at St. Vitus’), he nevertheless lived a disorganized life full of conflicts (particularly with the said Rudner), perhaps even a life plagued by failure. He was prematurely fired in 1612, failed to receive the promised sum of 200 gold pieces, and was in such difficult financial straits that he had to sell his specially built archycymbalum based on absolute tuning, a reflection of the composer’s high qualities as theoretician. His work “Liber I. Missarum… ” printed in Mikulat Straus’ shop in Prague In 1609, a luxury, richly illustrated work dedicated to Rudolf II consists of church compositions. In the first Mass, “basim Caesar vive”, each of the voices features a Latin adulation of the Emperor. Philippe Schondorff (b. Liege 1558, d. Prague after 1617), is little known. He was trumpeter in the imperial orchestra and music tutor in aristocratic families. In Prague he was supported by the chaplain and Imperial Almoner Jacob Cimarrhae of the Netherlands, to whom Schondorff dedicated his five- and six-voice odes. His almost unknown “super Usqueqpo Domine” Mass was included in the rare Mass collection in St. James’ church at Kutna Hora, Bohemia. In 1587 he composed another mass, hitherto undetified, dedicating it to Rudolf II. Nicolaus Zangius (b. Brandenburg 1570, d. Berlin 1620) is also less well known as composer. Almost a generation younger than all the previous authors, he arrived to Prague at the time of the Imperial orchestra’s greatest fame, was engaged by it on 1 October 1602, and drew the pay of an imperial court servant. He also worked in Northern Germany and at Danzig/Gdansk. His Magnificat is dashingly dedicated to Emperor Rudolf; it was printed by M. Straus in Prague in 1609 in luxury, late Renaissance make-up. The Magnificat in its monumental finale foreshadows the coming Baroque. Other important composers joined to the Rudolfian orchestra included Jacob de Kerle of the Netherlends, and the organist Jacob Hassler. The orchestra had about 45 singers, a boys’ choir, a 12-member trumpet ensemble, and a number of instrument players. For all named composers Prague played an important role. Their compositions are mostly dedicated to Emperor Rudolf II who helped to improve the financial situation of the composers. Due to a revival of ancient music,these composers’ works are performed again. 1576 St Adalbert’s Chapel at the west facade of St Vitus Cathedral was finished by Ulrich Avostalis. Under Rudolf II, Novy Svet (“New World”) quarter expanded beyond the walls of Hradcany.